Your inflatable hot tub filters play a crucial role in your hot tub. They filter out the dirt and impurities from the water, keeping it clean and healthy. They also trap the dirt and stop it from getting into your hot tub’s pump and heater. If your filters fail in their task, then your water will quickly become unhygienic and your motor unit will be put under a lot of strain. So as you can see, it’s important that you take a little time to care for your filters. And the best way you can do that is to clean them regularly. It only takes a few minutes to clean a filter, but doing so means it will be in the best possible condition. It will then be able to do its job of keeping your inflatable hot tub running at maximum efficiency. How Often Should You Clean Your Inflatable Hot Tub Filters? This depends a little on how often you use your inflatable hot tub and how long you use it for. A rule of thumb is that you should rinse the filter in clean water after each time you use your hot tub, and then give it a deeper cleaning once a week. Then – again depending on how often you use your inflatable hot tub – you’ll need to change the filter every month or so. We recommend changing your filter this often if you use your inflatable hot tub four or five times a week. If you use it much less than that, say once or twice a week, you can get away with changing the filter once every 8 to 10 weeks. You still need to rinse the filter, however, every time you use your hot tub. After you have owned your inflatable hot tub for a while, you’ll be able to spot when it’s time to change the filter. The pleats will look a little frayed; they might be discolored; or they might even become hard from a build-up of calcium. You’ll know when it’s time to replace your inflatable hot tub filter. Firstly, check your owner’s manual or DVD on how to remove the filter cartridge from your particular inflatable hot tub model. If it doesn’t come out easily, don’t force it in case you damage the screw thread. Remember to always turn off your motor unit before you remove the filter cartridge. You must never run the motor unit with the filter cartridge removed. If you do, this can cause damage to the motor, which could end up costing you a lot of money in repairs – you might even have to buy a new unit. Once you remove the filter, examine it for any damage or wear and tear. If the pleats are looking frayed, then it’s time to replace it with a new filter. If it still looks serviceable, then you have two options, depending on which type of cleaning you are going to carry out. Every time you finish in your inflatable hot tub, turn off the motor, remove the filter, and either run it under your faucet or under the spray of a garden hose. Be sure to give it a vigorous soaking. under a strong flow of water. In this way, you’re getting rid of all loose dirt and organic matter that is trapped in the pleats of the filter. Gently open up the pleats and make sure all dirt, hair, and all other debris are washed out. Doing this means the filter can operate more efficiently the next time you use your hot tub. You might also want to use a special tool which attaches to your garden hose and forces the water deep into the pleats of the filter for a really good clean. The Mi-Way Aqua Comb over on Amazon is the one we recommend. It’s not too expensive, it gets great owner reviews, and it’s adjustable so you can control the force of the water. It’s easy to overlook doing this simple task of rinsing out your filter, but just a few minutes’ work each time will prolong the life of your filter. As we mentioned, you also need to deep clean your inflatable hot tub filter once a week. To do this, you need a bucket of water and a cleaning product such as Leisure Time Filter Cartridge Cleaner, which you can get hold of on Amazon or Walmart websites. 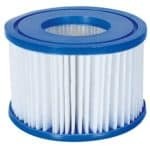 You might also want to get hold of the Spa Filter Cleaner Tool we mentioned above – although this is entirely your choice: you definitely can deep clean your filter cartridge without this tool. Place the filter cartridge on the floor outside and spray it all over with the filter cleaner. Then let it sit for about 15 minutes. 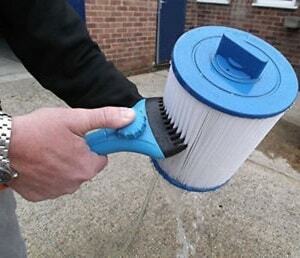 Next, use a garden hose – with the cleaner tool attached if you have one – and thoroughly rinse the filter cartridge. Make sure you wash off all the filter cleaner, otherwise any residue left on the pleats will cause the water to foam. To avoid this, plunge the filter cartridge vigorously up and down in the bucket of water several times. If the water looks a little foamy, there is still some cleaner left on the cartridge, so keep rinsing it with the garden hose. At this point, some inflatable hot tub owners put their filter cartridge in the dishwasher and run it through a short cycle – without any detergent – to make sure it is thoroughly rinsed. You can certainly do this; however if you do it too often, then the power of the water in the dishwasher will soon destroy the fibers of the filter pleats. So if you put the same cartridge into the dishwasher every time you deep clean the cartridge, you are going to shorten the lifespan of the cartridge. Make sure you always have a replacement filter cartridge in waiting. It’s annoying to remove the cartridge from your hot tub and see that it’s worn out and unusable and you don’t have a replacement. Purchase a multi-pack of replacement filter cartridges from a site like Amazon. You’re going to need several over the course of a year, and a multi-pack will save you a lot of money in the long run. Don’t use detergent to clean the filter cartridge, as it can cause foaming in the water the next time you use your hot tub, which means you’ll have to shock the water. 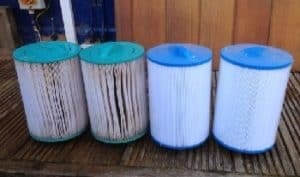 Don’t use bleach to clean the filter cartridge either, as this will destroy the fibers of the pleats and drastically shorten the life of the filter cartridge. When you replace your filter cartridge, soak the new cartridge thoroughly in Filter Cartridge Cleaner and leave it to soak overnight in an empty bucket. Then, the next morning, thoroughly rinse the cartridge in clean water to completely remove every trace of the cleaner. Hopefully, you can see how important it is to clean your inflatable hot tub filter regularly. Just a small investment of time can save you a lot of effort, time and money down the line. That’s because a clean filter reduces the need to check and change your sanitizer levels, and it even greatly reduces the need to shock your hot tub. Thanks for reading!